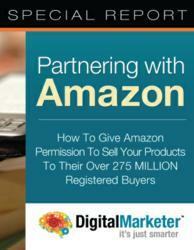 DigitalMarketer.com's article from today is addressing how to get published on Amazon with its latest Special Report. For tiny commissions and miniscule transaction fees, Amazon is the ultimate consumer marketplace to smart business owners. Amazon is the all-time king of e-commerce, and it’s become the answer to the question “How do I get published?” Every value-laden feature of Amazon is explained in the newest Special Report from the Digital Marketing Labs. DigitalMarketer.com’s latest article shows that getting the most out of an inexpensive, user-friendly marketing technique has never been so simple. “Partnering with Amazon: How to Give Amazon Permission to Sell Your Products to their Over 275 Million Registered Buyers” offers ingenious advice on teaming up with the online retailer. Entrepreneurs and marketers are identifying the opportunities with Digital Marketer’s Special Report and are being rewarded with high growth in web traffic and promotion. Aligning digital or physical products with Amazon’s enormous customer base is a win-win, said the article. Producers provide the content, and Amazon is more than happy to collect it, display it, sell it, and even take care of customer service for it. For tiny commissions and miniscule transaction fees, Amazon is the ultimate consumer marketplace to smart business owners. The online retailer quickly became the go-to place for Internet shopping, and has grown to include various self-publishing and selling programs to fit differing needs. Kindle Direct Publishing takes written digital content and makes it available to millions of e-readers. CreateSpace is Amazon’s print-on-demand service. The WebStore gives entrepreneurs their own e-commerce site, backed by Amazon’s team of experts. Every one of these is thoroughly described in the Special Report. Publishing with Amazon can be customized to fit specific business needs. Amazon.com is one of the most-visited websites in the world, and holds more search engine power than any other retailer, said the article. As people search for the products and services they want, those found on Amazon repeatedly show up higher in the rankings. That can generate web traffic to and from a business’s own site, and raise its authority as a leader in its specific niche. The useable information in the Special Report is part of Digital Marketing Labs’ devotion to helping individuals and businesses market themselves and their products with the most successful strategies using the most advanced research and analysis available. “Partnering with Amazon” is the tell-all guide to selling products and publishing content with the help of a retail goliath. No longer will independent business owners ask themselves “How do I get published?” now that the Special Report is available to Digital Marketer subscribers.